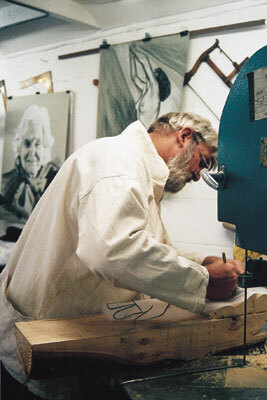 As artists and carvers we need to have the inspiration and a concept before we even start work. 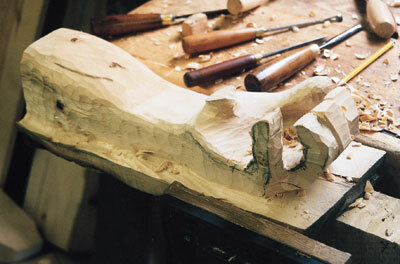 What we require is a subject for the carving, and sometimes the idea and the mood can be slow in arriving. 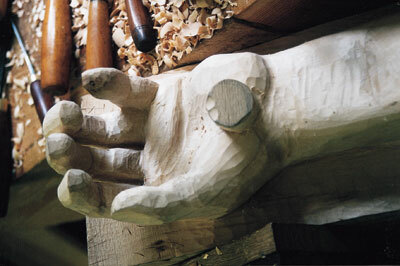 My Christian faith is a source of inspiration for many of my carvings and when contemplating the fate of Christ I cannot help but cringe at the shockingly painful method of his death. 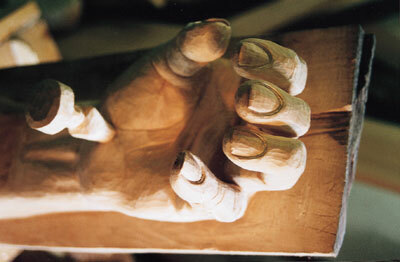 Jesus crucified on the cross is the best-known symbol of Christianity throughout the world and I thought that this might be a good place to start to look at the carving of the human hand. 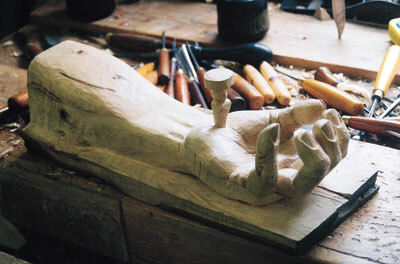 It occurred that the nail through the palm was mankind itself and after pondering further I decided I would carve just the hand, cross and nail, with the latter stylised into the shape of a man. 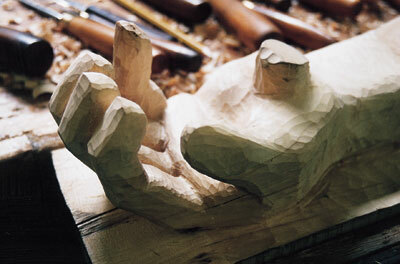 Then are times when carving a whole subject is unnecessary, a part of it will often tell the tale just as well. When looking to express a specific point this can sometimes be preferable. Shortening in this way is called abstraction. The first thing to establish is the attitude of a pierced hand. You will need to find where the nail actually went in. To determine this I read the autopsies of crucified Christians in the catacombs in Rome. Contrary to the way most pictures portray the crucifixion, the nail was not put through the palm because it would then pull through the flesh, especially with the whole weight of the body writhing against it. It was in fact put through the wrist, or more precisely through the hole in the middle of the group of bones that form the wrist. A nerve point is there. 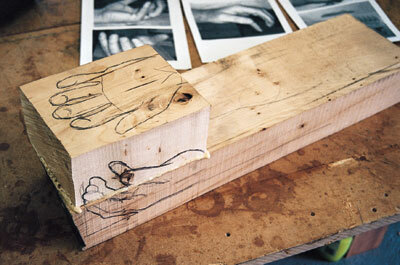 In this case a slightly larger than life-sized hand will have greater impact, and as is often the case lime (Tilia spp.) 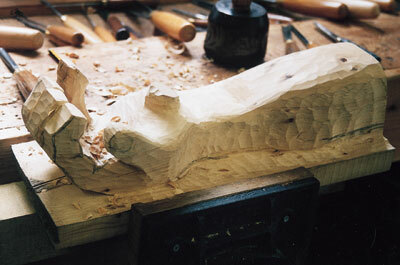 will hold the detail as well as any timber. Using your own hand as a model try to imagine how piercing would affect the fingers. Take pictures from all angles and use them to create a pattern. The next step to make the block big enough to fit (see photo 1) and then transfer the pattern to it (see photo 2). 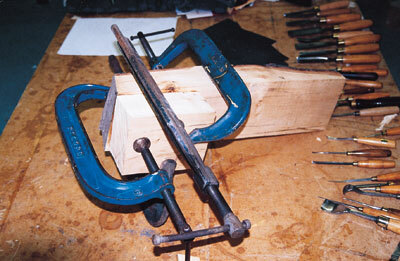 Bandsaw the shape (see photo 3) being generous around the line - too much detail on the saw can be limiting. 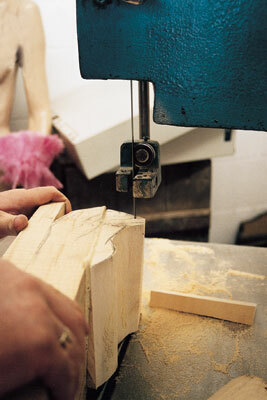 If you do not have access to a bandsaw, rough it out with a suitable gouge - a 1in No.4 will do nicely. 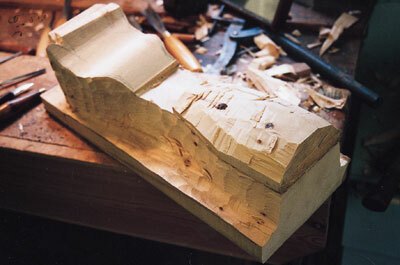 Re-draw the pattern onto the side you have sawn off (see photo 4). Chop around the outline stopping nicely short of the backing board which will form the arm of the cross (see photo 5). Begin the rough rounding process (see photo 6), remembering not to get too close to the lines to allow for later adjustment (see photo 7). 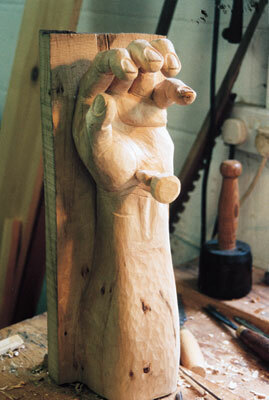 Free the fingers but don't round them off yet (see photo 8). Marking the crease and details of the bent fingers will help you to visualise them better, using your own hand as a ever-present reference (see photo 9). A strategically-placed mirror will help you although do remember that in the reflection you are looking at, the hands will be the wrong way round. 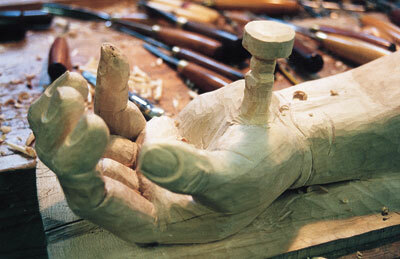 Round off the fingers and refine the hollowed palm (see photo 10). Further refine the rounding and general shapes (see photo 11). 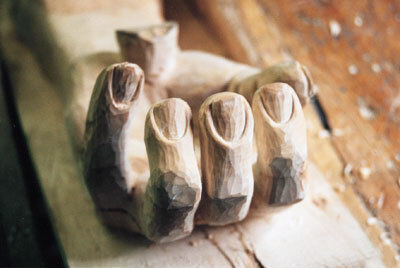 Cut in the fingernails on each finger (see photo 12) and continue until they are all at the same stage of completion (see photo 13). 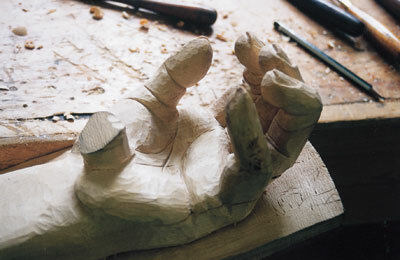 Add the crease lines in the palm and underside of the fingers (see photo 14). Using a small V-tool, carve in the cuticles taking great care not to run them out and keep them even - there is not much room for error here. 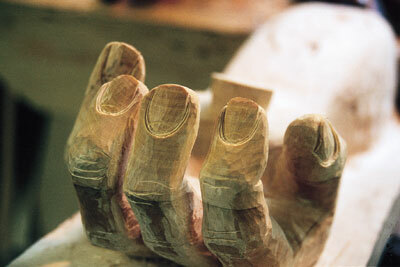 Using the tip of a sharp knife or a suitably swept gouge, incise the half-moons of the fingernails (see photo 15). I added an extension to the nail post so it would become more apparent and dramatic. I could have left more on at the bandsawing stage but changed my mind about the length of the nail when I saw what the actual effect was, so in the end I glued it on. 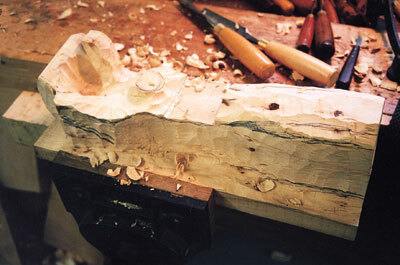 Carve the spike round taking great care as it is all end grain and the pillar is brittle. 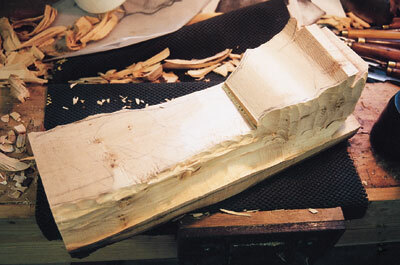 You are likely to feel some movement as you carve (see photo 16). Further refine this nail doing all the heavy cutting at the top while the base is strong enough to take it (see photo 17). 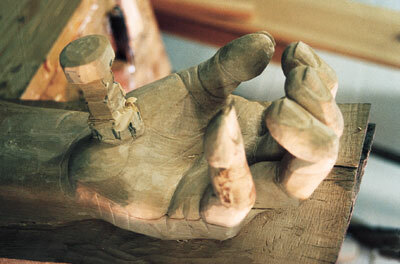 Work towards the narrowest and most delicate point which is where the nail meets the wrist (see photo 18). Stand the work in a different position to help you see its shape from a fresh angle. It never ceases to amaze me what you see when you step back and take a fresh look at what you have just been working on. If something just doesn't look right, view it in a mirror and more often than not, the mistake will be staring you in the face. Looking at it upside down (the work, not you!) often has the same effect. When you are satisfied that the general shape is right, cut in the lines and wrinkles on the palm and wrist (see photo 19). 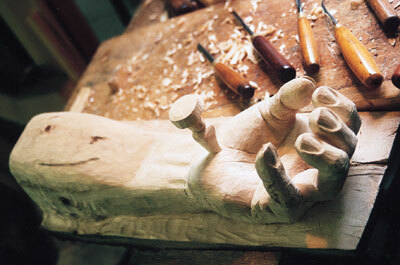 Add the tendons and tidy up (see photo 20). 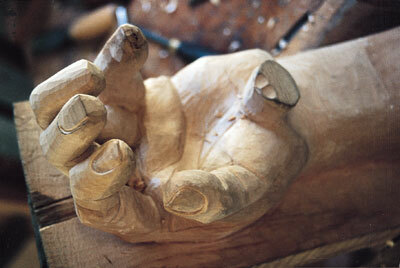 In this case I wanted the hand to be hard and strong but not too specific, just like the hands of a carpenter. The finished hand was then given three or four coats of wax polish which was applied directly on to the wood (see photo 21). Don't polish the cross as the contrast to the hand is important for the illusion of them being separate pieces. Wax polishing in this way has the effect of retaining the colour and gives the work a pleasing sheen and feel to it, although French polish, linseed, tung or Danish oil are all good alternatives. 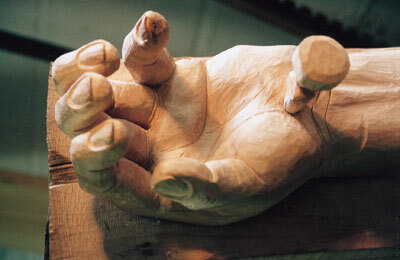 "In this case a slightly larger than life-sized hand will have greater impact"